If “San Andreas” came out in the late nineties, it’d simply blend in to the explosive shuffle of “Armageddon,” “Deep Impact,” and “Twister.” The only thing that distinguishes “San Andreas” today is that it’s coming out in a summer of much more creative blockbusters like “Mad Max: Fury Road,” “Avengers: Age of Ultron,” and even “Tomorrowland.” That’s hardly a compliment, though. Even if you’re looking for a movie with a lot of buildings crumbling, there are a handful of superior alternatives still playing at your local Cineplex. Thus, this movie has no purpose whatsoever. Wow…just…wow! There’s not a single original character in this entire lineup. It’d be one thing if they were fun, memorable stereotypes like the supporting cast in “Pitch Perfect,” but everyone’s the cheapest cutout you can think of. The only thing this cast has going for it is that nobody’s unbearably annoying. Regardless, would it have really killed the filmmakers to try something new with any of these archetypes? What if it turned out Johnson was the whimpering chicken and Gruffudd was the daring hero? What if Daddario had to save her father for a change? You people put so much thought and effort into the effects that surely you could have put some into your characters. 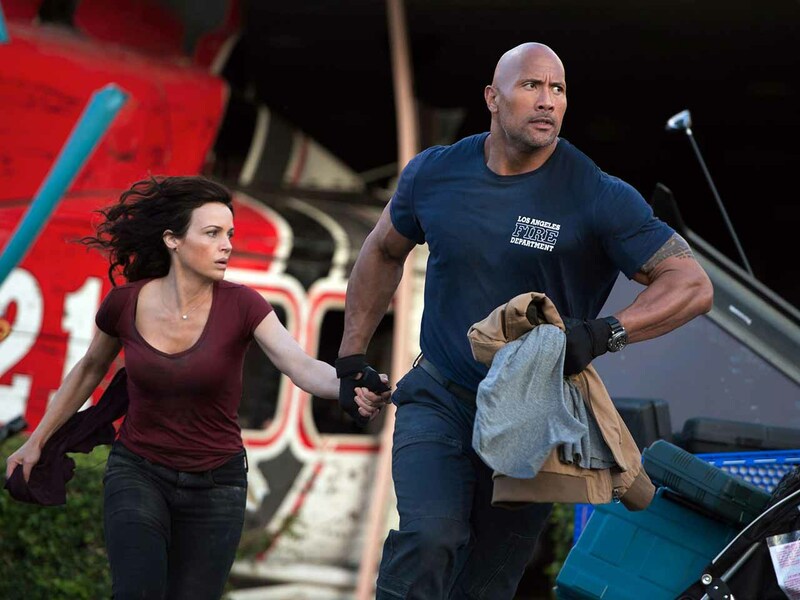 Now with that said, “San Andreas” is certainly a well-crafted movie from a production standpoint. The action is intense, the visuals are mostly convincing, and the scope always feels huge. At the end of the day, however, you’re just watching people you don’t care about run away from destruction for almost two hours. There isn’t any art or skill to depicting that. Interspersed throughout the nonstop chaos, we get every below the belt cliché you can think of: The scene where somebody sacrifices himself to save a little girl, the scene where somebody performs CPR on another character who obviously isn’t going to die, and countless scenes of forced exposition. The screenwriters seem to think that giving the characters some basic backstory also gives them personalities, but it’s just a lazy copout to actually developing them. By the time the credits roll, you half expect Michael Bay’s name to pop up. Actually, “San Andreas” was directed by Brad Peyton, the same genius who made “Cats & Dogs: The Revenge of Kitty Galore.” Whether or not he’s a step up or a step down from Bay is hard to say. In any case, he’s made a disaster movie that is in itself a disaster. Unless you’ve never seen “2012,” “The Day After Tomorrow,” “Independence Day,” “The Poseidon Adventure,” “The Core,” “The Towing Inferno,” “Dante’s Peak,” “Earthquake,” and “Sharknado”…well, then you should still avoid “San Andreas” like a tidal wave.